So here I am for only the second time in my life in the beautiful Yorkshire Dales. For those who don’t know, the Dales are at the westernmost fringe of Yorkshire, the largest county in England, and border Cumbria, home to the Lake District. The Dales are essentially valleys, and there are many caves and hills too to punctuate the landscape. A very rural area, some of the Dales have become rightly famous for all manner of means, including Wensleydale for its cheese, and a number of dogs too, including Airedale. I am here of course for the Yorkshire Three Peaks, but it is such a shame to be anywhere and not look around you and appreciate the area itself for what it is. Arriving last night after a long drive from Buckinghamshire (made considerably longer by a combination of Bank Holiday traffic and people making the most of the beautifully sunny weather), the first thing I did upon arrival was to have a further drive around the area to get my bearings. Although this is early in the season as far as the total beauty of the landscape is concerned, the one thing that struck me more than anything else was the fact that we are still at the end of lambing season. There are lambs absolutely everywhere! – a truly joyous sight – there is little more pleasing sight in this country for me than a field of gambolling pristine white baby sheep. Bliss! So my arrival in the evening was all about settling in for the next day. The trek was to start at 6.15am (I arranged an organised trip through the same company I am doing the subsequent Three Peaks Challenge with). I struggled to find accommodation in the area, and the nearest place I could find was a pub (what a shame!) called the Craven Heifer in the village of Stainforth, about 5 miles from the meeting point. The folk at the pub were wonderfully accommodating, illustrated by the following: Upon arrival they asked me what time I would like breakfast, to which I said that I was doing the Y3P, and that I would therefore need to leave at 6am. They immediately without hesitation said that they would have breakfast for me at 5.45, to which I thanked them hugely, knowing that a good breakfast, even at that time in the morning, was essential to get me through 26 miles. The breakfast was indeed something to savour, and at precisely 5.58am I was out of the door on my way to the departure point in Horton in Ribblesdale, on a very cold morning, under stunningly cloudless skies, accompanied by a frost to boot. The temperature was -2 degrees. A coach awaited us to take folks up to Chapel Le Dale, where the trek over to Ingleborough, the first hill, would start. 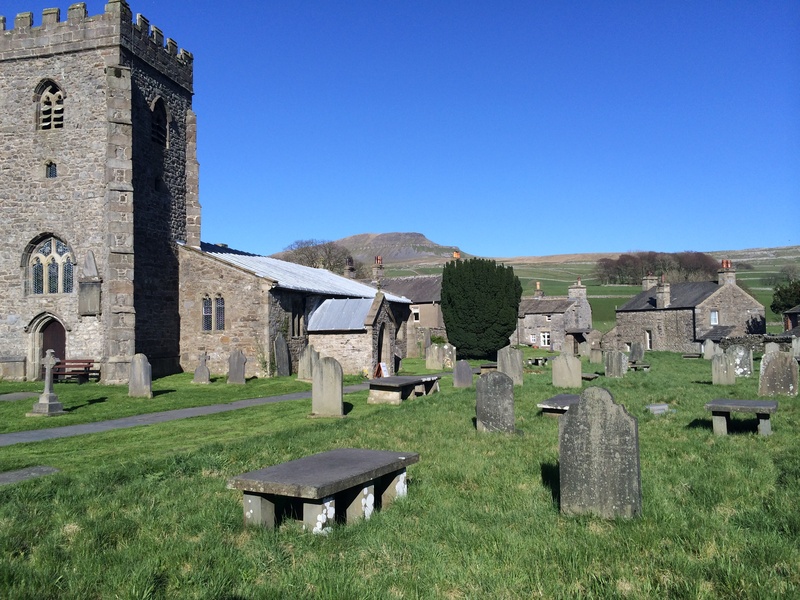 The churchyard in Horton in Ribblesdale, Pen-Y-Ghent in the background. Well at 6.50 precisely we were underway. 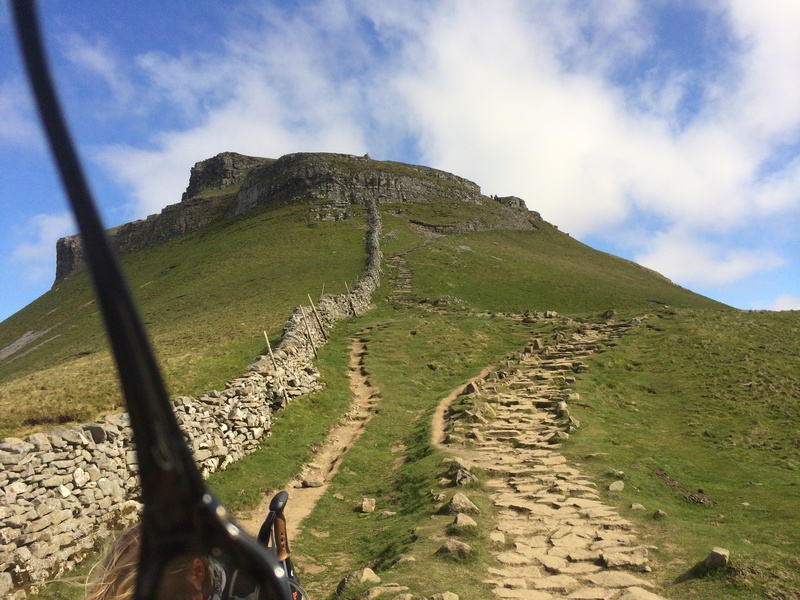 It was a straight shot up Ingleborough, and the path became fairly steep within the first mile. The idiocy of my presupposition that the group of ‘girls’ that I was with wouldn’t be the quickest group was immediately dispelled. Firstly they were steamrollering ahead of everyone, including the guide, and secondly I overheard one of them say that “this would be much easier if we could run it”. It turned out that they were mostly marathon runners from a running club in Cheltenham. Lessons to be learned from this little exercise are innumerable, but I learned my place, and suffice to say that it was at the back! Ingleborough looks like the most innocuous and frankly easy of peaks, but it is far from it. There is a very steep, if not overlong, approach at probably 55 degrees or more. It certainly got the old heart pumping. The walk was all uphill to the summit at around 2,400 feet which came just under three miles in. We had been walking for exactly one hour. Our guide Trevor, of whom more later, told us that an hour and a half was the norm, so that made us all feel pretty good, and me pretty out of breath. From near the summit of Ingleborough, looking back down towards Whernside and the Ribblehead valley. The weather by now was wonderfully clear, as it would stay pretty much all day as seen in the photograph above. From the summit of Ingleborough, and after turning back on ourselves at the trig point, we set off on a long downhill meander towards Horton in Ribblesdale prior to hill two, which would be Pen-Y-Ghent. 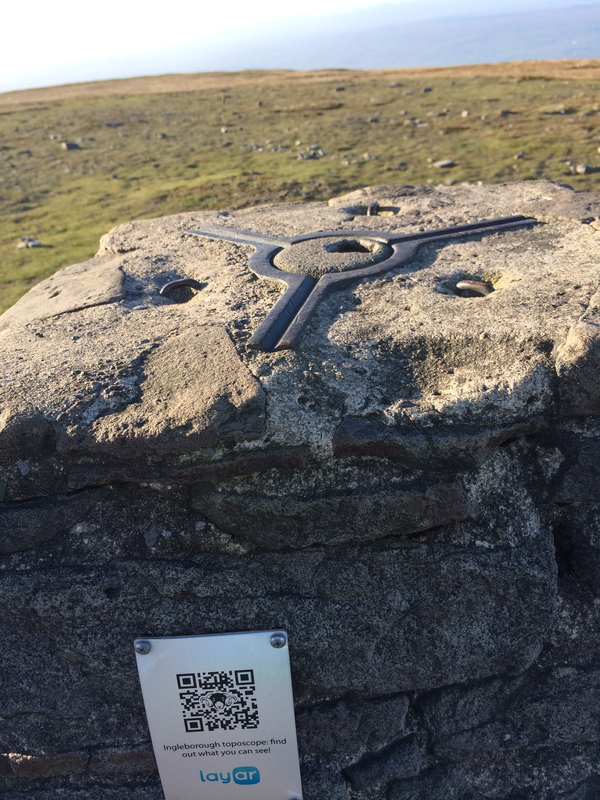 The trig point on Ingleborough, adorned with QR code – an interesting blend of the old and the new. After a ‘bio break’ and an energy bar or two, we then headed from Horton straight up to Pen-Y-Ghent. Again, this hill looks really innocuous from the road, but proved to be quite a good pull. Again it was about 2 and a half miles of ascent, to the summit at about 2,400 feet. The top was almost a scramble in places, and my hands were down a couple of times. 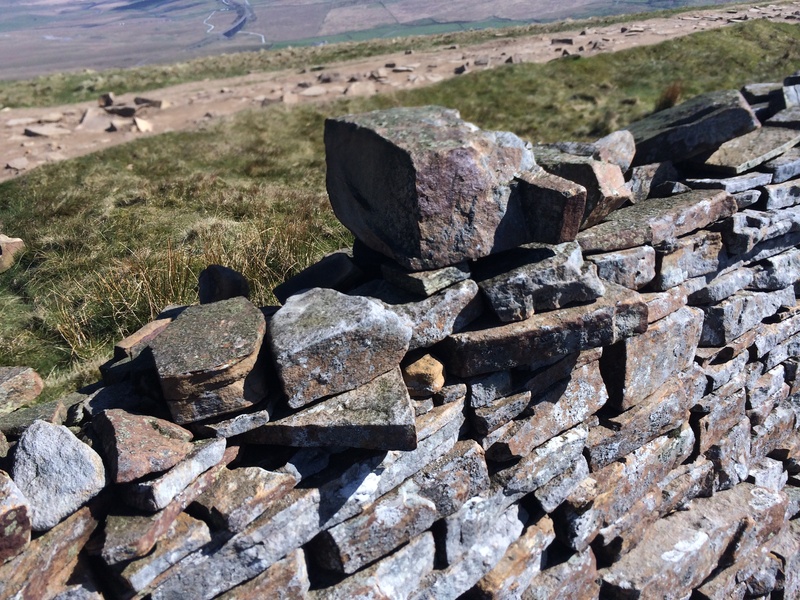 Towards the top of Pen-Y-Ghent – they have done a good job with paving these areas to help stop erosion. And getting closer now to the very summit…..
From the top of Pen-Y-Ghent, after taking lunch there in the well designed S-shaped shelter (it’s a bit of a windy spot), we headed down again for the long trek to Whernside. 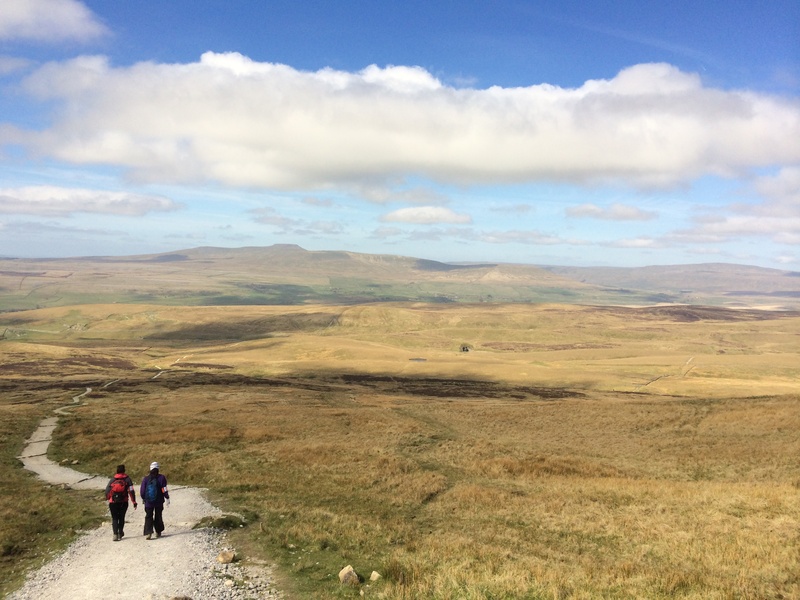 Starting the long trek to Whernside (far right) – Ingleborough can be seen in the far (centre left) distance too. Peak to peak, Whernside is about 12 miles from Pen-Y-Ghent, although only about 8 or 9 until you start your ascent from the Ribblehead viaduct. 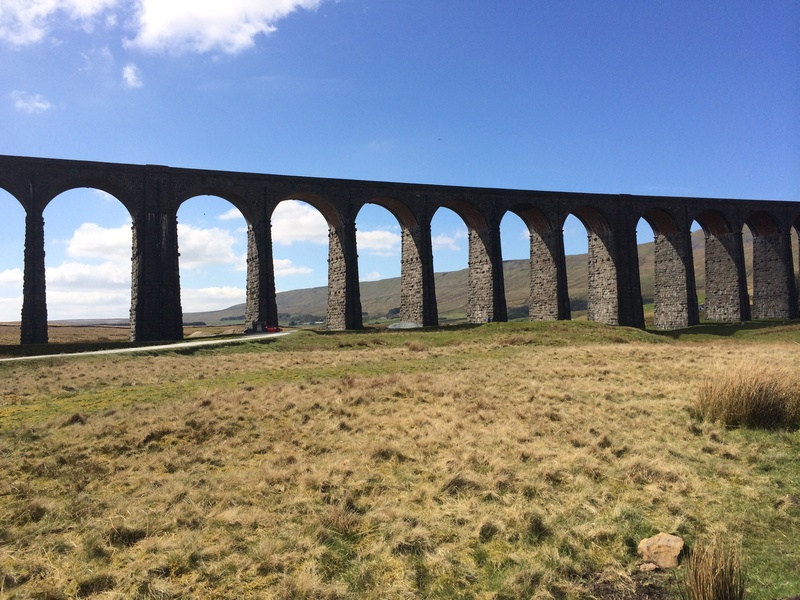 The Ribblehead viaduct is rightly famous for one of the UK’s most picturesque train journeys, on the Settle to Carlisle railway, and was built in around 1870. The walk down is straightforward, and was nicely punctuated by a tea and cake stop from a minibus, provided by the organisers. Tea, I have to say, never tasted so good, and it was nice to have a brief rest and a sit down, even if I was itching to get up and go again before most of the others were. Upon reaching the Ribblehead viaduct we began on a meandering path along the edge of the railway, which gradually then began to talk a big wide S turn to a ridge leading up Whernside itself. Underneath the mightily impressive Ribblehead Viaduct, the lower slopes of Whernside in the distance. The climb up Whernside is fairly long, but reasonably gentle, and well paved for most of the way. About two thirds of the way up though, the wind (which had been very gentle for most of the day) whipped up along the summit ridge to the point where it made just standing up a significant challenge. I have to say it was about the most brutal wind I have ever encountered, and had it been in our faces, I am sure that many people would not have actually made the top at all. As it was, the wind blew sideways, and so it was a mere balancing act, albeit still of some at times epic proportions. From the trig point on top of Whernside. in the far distance below you can just make out the Ribblehead viaduct way below. As you can see from the above, I’ll never make a photographer, but never mind, at least it means something to me! The descent from here was for the most part cold (everyone put at least two layers on at the top, and hats and gloves too), and steep, making for very achy legs after 24 or 25 miles of walking. The group split at this point, and everyone basically took the descent at their own pace, which for me is quite quickly. I find it more tiring to go slowly on a steep descent, and find I just have to go at my own pace. The guides had described the descent here as a bit of a staircase, and I’d say it is steeper than that for the most part. I’m just glad it was dry on the day I did it. From the bottom of Whernside, there was about a flat mile through farmland back to the start at Chapel Le Dale, and the appropriately named Hill Inn. A very pleasant pint of Black Sheep Bitter later, and our certificates duly despatched, it was all over. 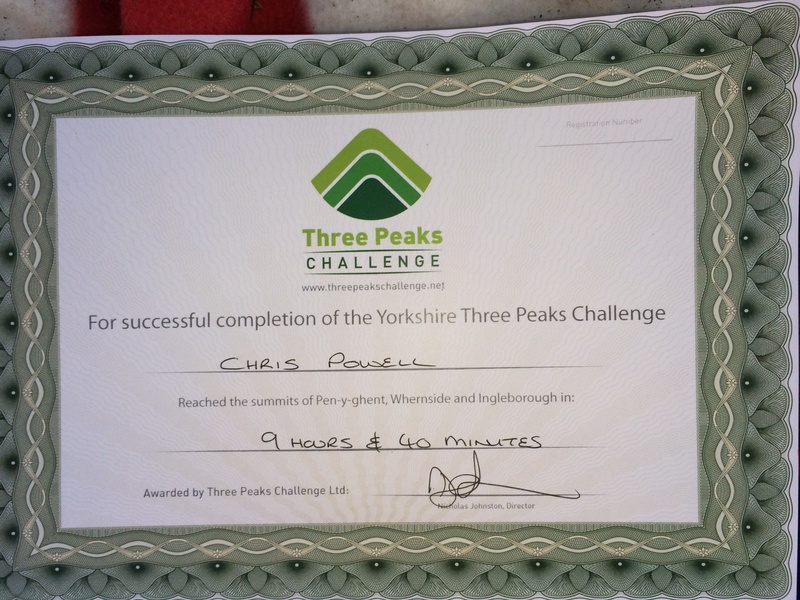 My finishers certificate – we were in the first group to finish on the day. ‘Average’ time is apparently around 12 hours. My takeaways from the day are so many. For one, I was so lucky with the weather. The Yorkshire Dales can be incredibly wet, even in the summer, and this was just the most beautiful of days. Secondly, it was a great group of like minded and lovely people to be walking with, and that always helps a huge amount, especially when you are away on your own. Thirdly it gave me an appetite to come back to the Dales, it is a beautiful area and needs more exploring. Fourthly I met a great guide in Trevor, who provided me with advice, inspiration, and not just a desire to do more of this sort of thing, but also he actually helped me (inadvertently or not, who knows) to look at myself from a different angle. To question myself, and to push myself, and to realising that life is sometimes just too short. More of that in a later post perhaps……. who were brilliant throughout, from point of booking, to follow up emails, and all sorts of help along the way. 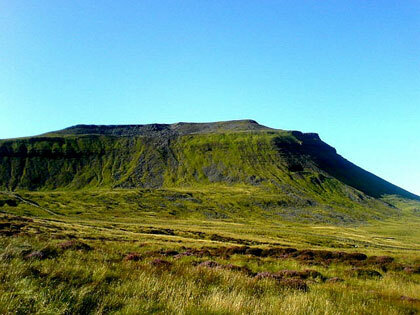 I’m doing the Welsh Three Peaks, and also the National Three Peaks with them in the coming two months too, so it seems like I have chosen very well, which is a great thing. Look them up, if you are considering a challenge like this, and then book with confidence – you are in very safe and knowledgeable hands. ….for my first adventure of the year. In fact my first of any kind for nearly two years now. And just thinking about that makes me quite sad. It seems that the last trekking trip I had was in August 2012, to the Berchestgadener Alps between Austria and Germany, and my last night away in the hills at the Ingolstaedterhaus brings back a host of great memories http://https://aquavista.me/category/german-alps/ which I would love to relive. But anyway – enough of the digressing! This weekend I have a fairly impromptu trip up to the Yorkshire Dales, as mentioned in my last post, to do the Yorkshire Three Peaks I’ll do around 26 miles, and three peaks that I have never even seen before. None of them have any technical difficulty, and the walk should take somewhere around 10 hours I hope. I haven’t though, as far as I can actually recall, done 26 miles in a day before, and so I am effectively in unchartered territory here. And as a couple of other factors slightly conspire against me, then perhaps it is not going to be quite the walk in the park that I though it might be. The first of those is the recent weather. I have been in touch with a couple of people who have done the Y3P recently, who tell me that the route is really really wet and muddy. It has been a very wet start to the year in the North West of England, and the weather is still around 9 degrees at best. I’m told I’ll need gaiters. This will certainly take its toll on a walk of such length if it is indeed that heavy. That’s the most popular way of them all. 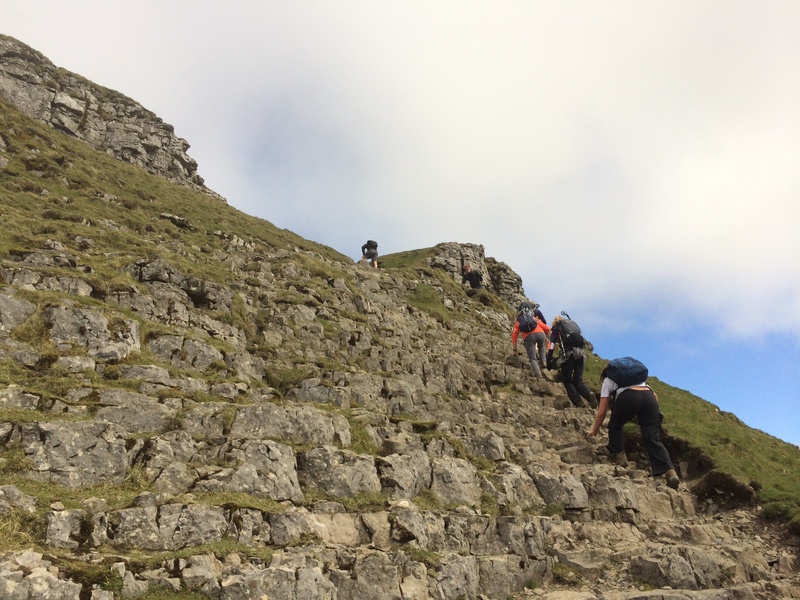 If you are a first timer, I’d advise you to do it this way because the last descent from Ingleborough is not too steep. Remember your last peak will be the hardest no matter what so this way might put less strain on your body for the final part. The ‘wrong way round’, apparently…. I hope most of all that the weather just stays fine, and then at least the whole thing will hopefully be manageable. There is nothing worse than a day in the hills when you have lashing rain and zero visibility, particularly when you just really want to a.) get away from it all, and b.) get a lot of miles into your legs. If I’m still in one piece at the end of it all when I wake up on Sunday morning, and if the weather is half decent, then I may even wander into the Lake District. That may well be a bridge too far, but we will see. I shall keep you posted – wish me luck! Well I thought I’d update on my plans for which peaks I am attempting this year, as it is ever changing and increasing! 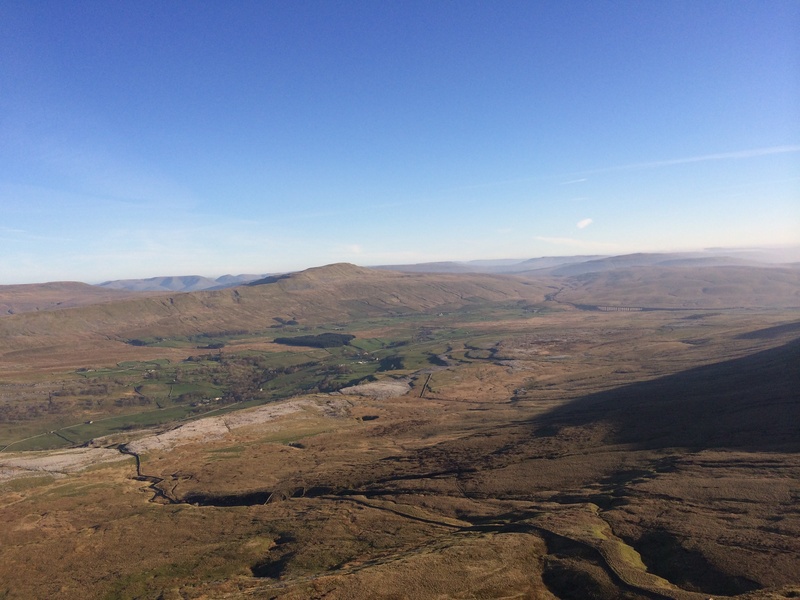 The Yorkshire Three Peaks, and, The 24 Peaks! 1. 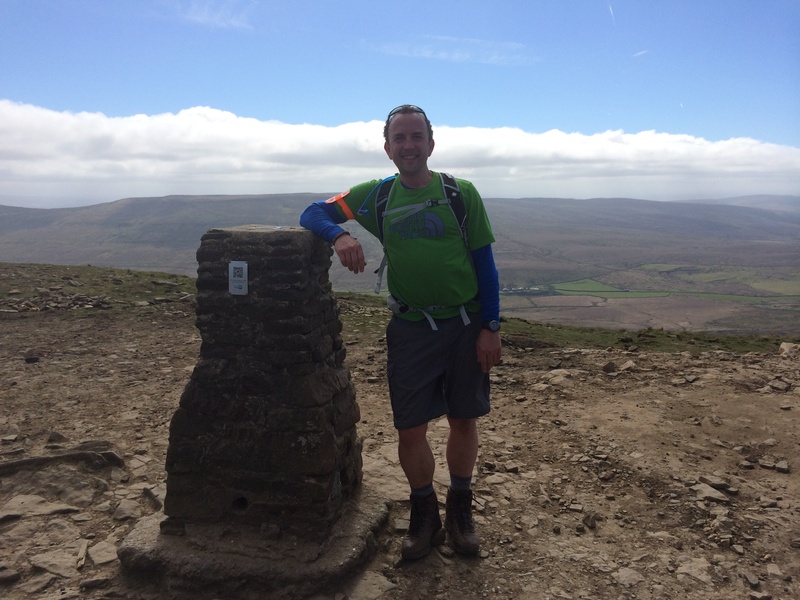 Pen-Y-Ghent – 691m, 2,267 feet. 2. 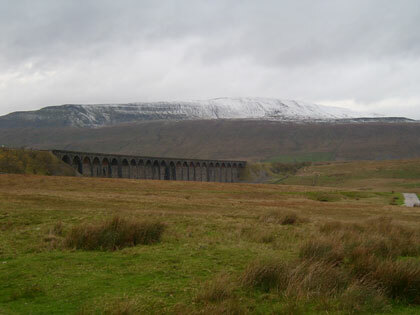 Whernside – 736m, or 2,415 feet. Whernside, North Yorkshire’s highest point. 3. 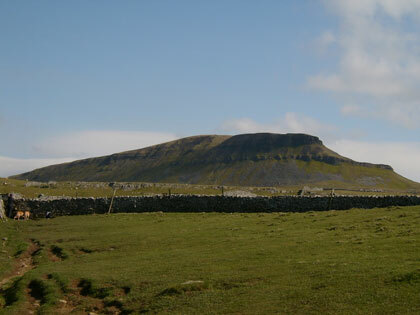 Ingleborough – 723m, or 2.372 feet. So whilst none of these places will exactly install fear into the most intrepid mountaineer, (or even me), they do represent a really good challenge. The challenge itself is to complete the three within 12 hours, and this involves a trek of over 25 miles, plus the three ascents, which are about 1,600m (5,250 feet) in total. It is very doable, but depends upon conditions and the like too. I’ve decided to go next weekend in fact, so am sure the weather will throw at me all sorts of exciting stuff. Now this sounds almost mad! Altogether to first day covers 28km and about 6,000 of ascent. The second day covers 25km and over 7,000 feet of ascent. So 53km (about 33 miles) and >13,000 feet of ascent should be incredible, if I make it. The appeal is severalfold for me, being firstly that it has got to be outstanding training for Mont Blanc (this will be in June, the month before Mont Blanc), and secondly that all of these hills are in the Lake District, which is just about my favourite place on this planet. I’ll be so glad to just be there, and give it a damn good go. Both days start at about 5am in the morning and involve 12-14 hour days.